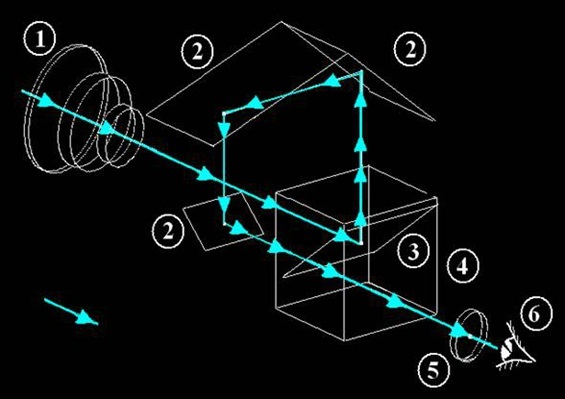 Especially during the first years of eye level slr constructions, there were engineers who sought other solutions than pure pentaprisms to give an upright, rightsided image. 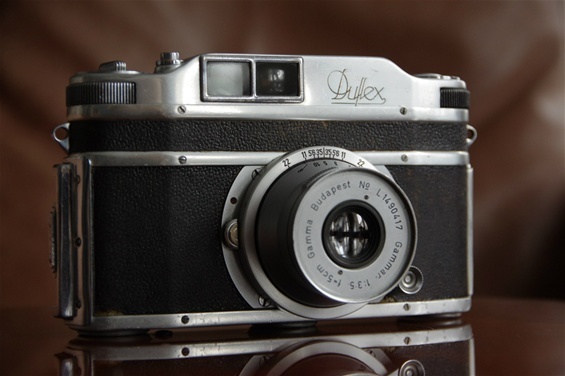 Gamma Duflex is the best known of these, as it was the first and the one that had the biggest impact on slr camera development. But there were others. I will try to present some non PP SLRs on this page. Some will hopefully be of my collection, some probably not. 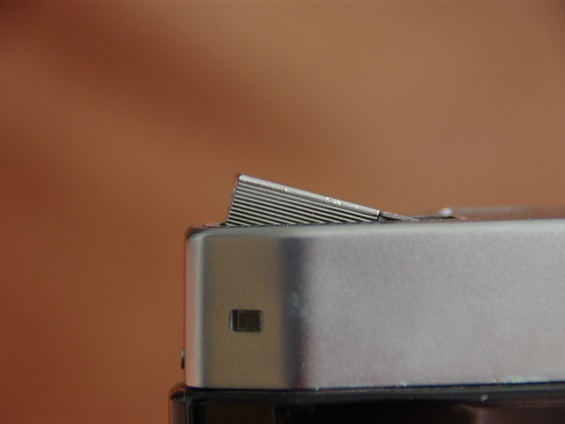 The eye level non PP SLR Gamma Duflex. DU from DUlovits, FLEX from reFLEX. Sn. 1490393. The non PP SLR to point out the future: The Sino Dulovits construction of 1943, presented by Gamma in 1947, produced from 1948 till 1950. The Alsaflex. A very advanced camera. Not of my collection. An add from early 50s. Metal shutter to 1/2400 of a second in 1952! Frenchman Lucien Doddin constructed this two-prism system. 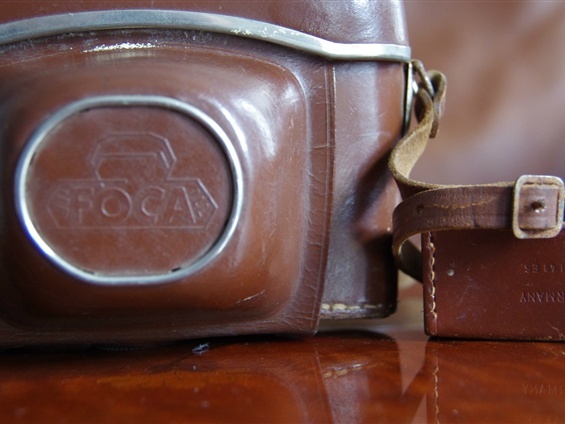 OPL Foca Focaflex was truly an Off Mainstream camera! 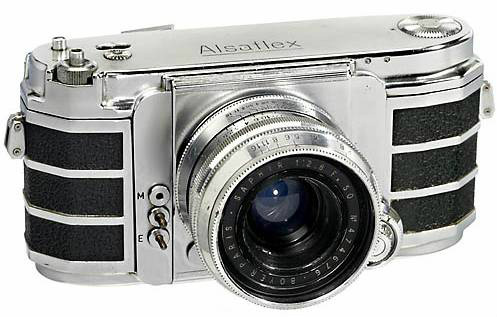 It was a Single Lens Reflex camera, giving a sideways and upright correct image through the finder, but like the Duflex and the Alsaflex, it had no visible penta prism house. The construction was very remarkable, as the mirror was not bent upwards, as on all others mirror cameras, but downwards. With other words; it was french in all its enthusiastic engineering. But also in its not so commercial approach. 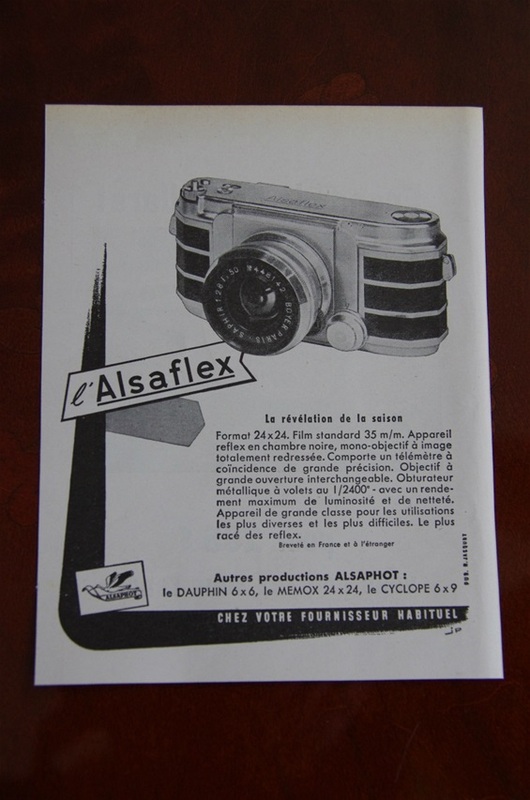 The first Focaflex was introduced in April/May 1959, and sold from June. Focaflex Automatic was released in 1960, introducing a COUPLED light metering! 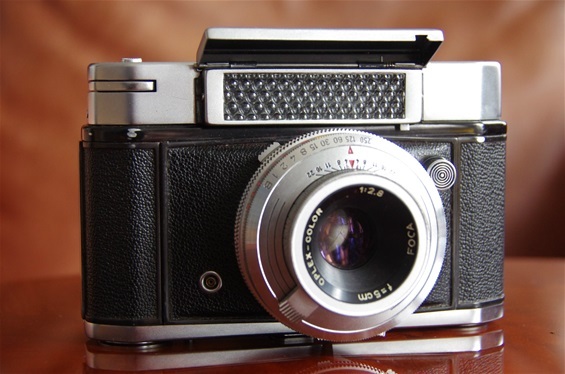 Focaflex II was introduced late 1961 with interchangeable lenses and sold until the OPL Foca company stopped production in 1963. Beautiful! Is there more to say? Yes: This is the Focaflex Automatic from 1960 with automatic diaphragm. Size: 140x70x74 mm included the fixed lens. Weight: 811 grams. Sn: 14.760 L.
A very remarkable construction! Light beams hits a silver coated semi transparent mirror that reflects downwards to a ground glass/mirror at the base. From here light is reflected up again, through the mirror to another 45 degree mirror at the top, finally coming through the finder. This construction implied a couple of problems: light would come in through the viewfinder, confusing the metering. Due to the semitransparent mirror, some light would also hit the film before shooting. (This was a leaf shutter camera with the shutter built into the lens, so there was no curtain to stop the light from hitting the film.) 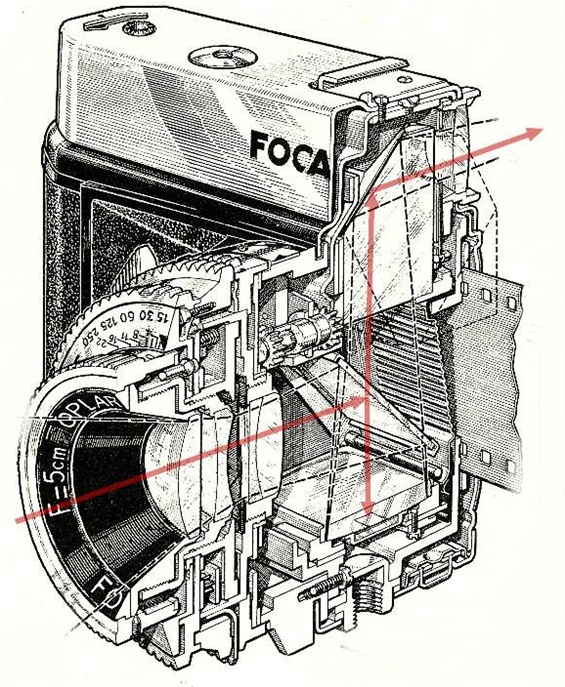 The Foca constructors solved this problem elegantly by installing a small baffle blocking the finder as the picture was taken, and another, bigger one behind the central mirror. This mirror construction with its filtration of light also gave a bit dimmer viewer, sometimes making it difficult to focus in low light. But many ordinary cameras at the time shared that problem. The Focaflex approach was later followed up by others. 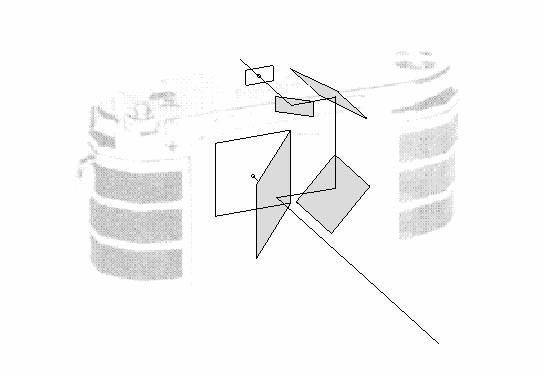 Canon tried to introduce a semi transparent mirror reflex camera in 1965, but met quality problems over time. 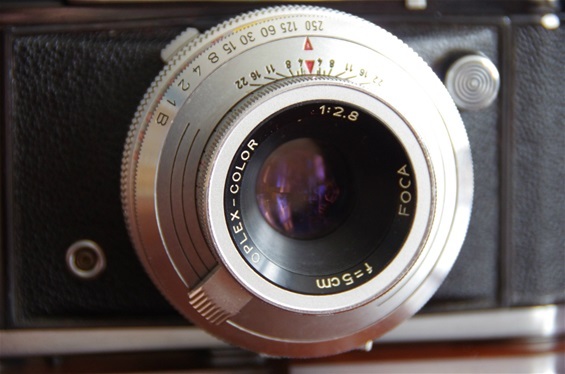 A fixed lens, the Foca Oplex Color 50/2,8. 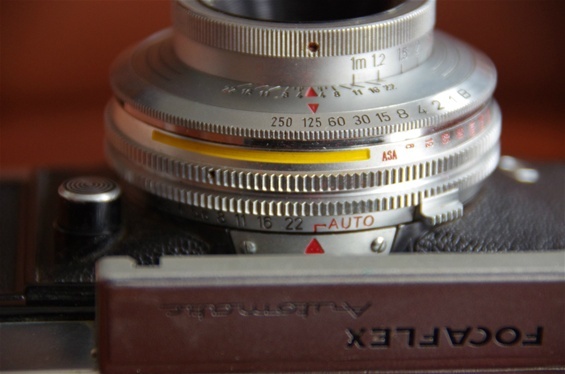 The focus ring with the lever gives a very smooth and easy fingertip focusing. 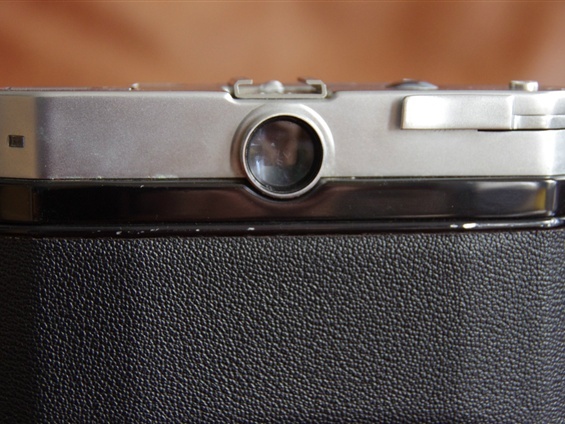 A big selenium light meter is disclosed when pushing the front element gently sideways, letting it flip open. 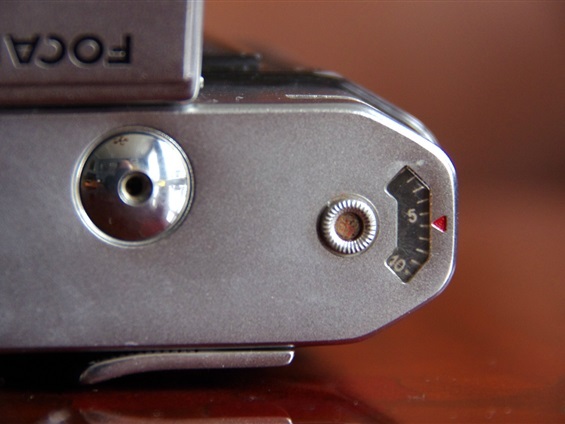 With the front flap opened, the Focaflex selenium meter reads the light. 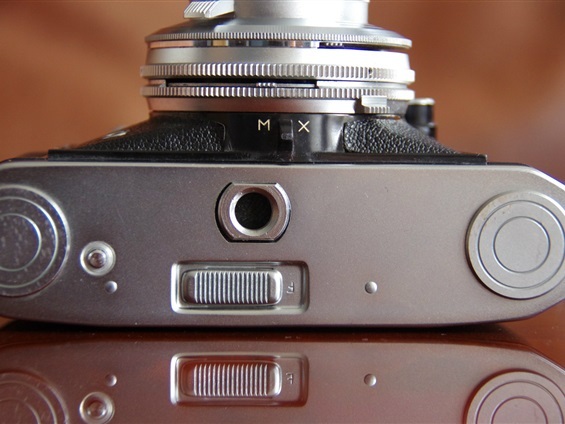 When the aperture ring is set to AUTO, the automatic aperture value based on given shutter time is chosen, and can be seen in the finder. Back of the camera. Winder to the right. 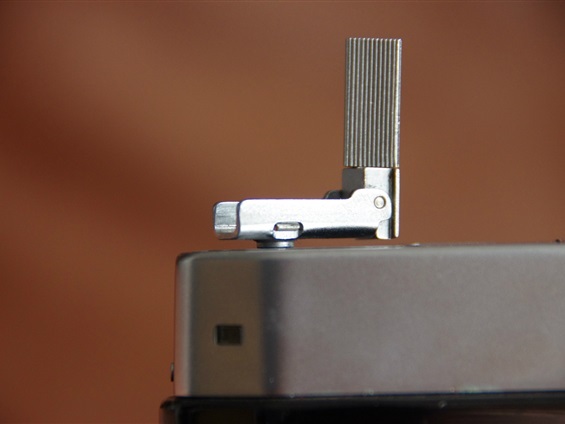 To rewind, push the right side of the hidden arm down until the left side rises. Lift the rewind crank up to its upper position. 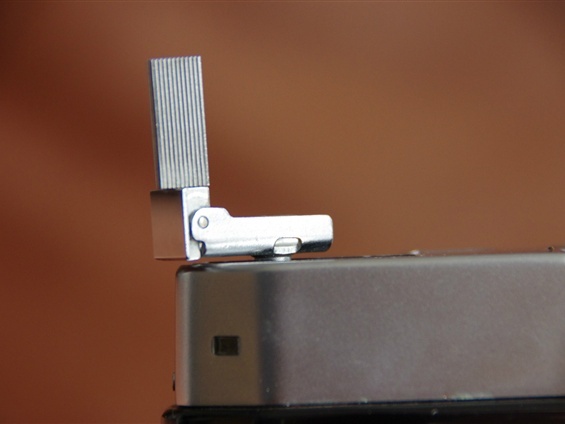 Removable base plate with rewind release button and a slide, O for ouvrir, F for fermer. Comes off with back wall. 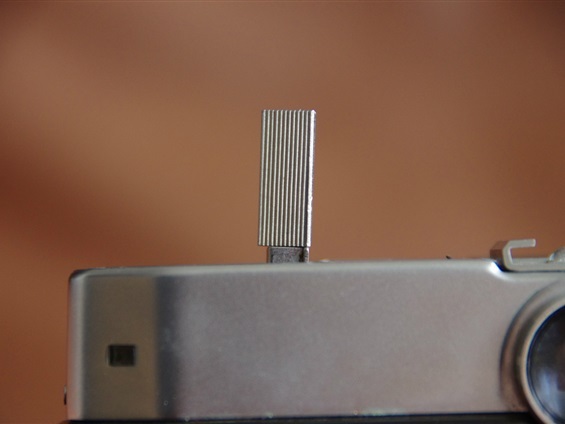 Shutter release button. Counter to the right, counting down from 36. A small dial to the left to change number.